Dessert is an indispensable dish in almost every country in the world. However, in Vietnam, dessert is not a “must” dish. Despite that fact, Vietnamese people still have created so many dessert dishes, from easy to complicated cooking desserts, such as sweet cakes, frief cakes, steamed cakes, sweet porridges…Vietnamese desserts are very plentiful and delicious, appreciated by many foreign tourists. Usually, after the end of a meal, it is common to find out something to eat to finish the whole meal, then the dessert dishes were born. The “dessert” word is most popular in the US, Canada, Ireland, and France, and then England and some countries of the Commonwealth. Although the custom of eating fruits and nuts after a meal is very old, along with the social development, eating dessert is a part of the standard Western diet. In the 19th century, the middle class in Western used dessert dishes as food for the festivals and holidays. Under the impact of mechanization of the sugar industry, sugar and sugary products became cheaper and popular rapidly, probably gave the development of desserts a chance to spread. There are some cultures which do not seem to prefer using sugar, but the sugary dishes are still very popular, especially Chinese cuisine. In Vietnam, usually, dessert is a separate meal, eaten after the main meals. Some restaurants in Vietnam just sell dessert dishes. 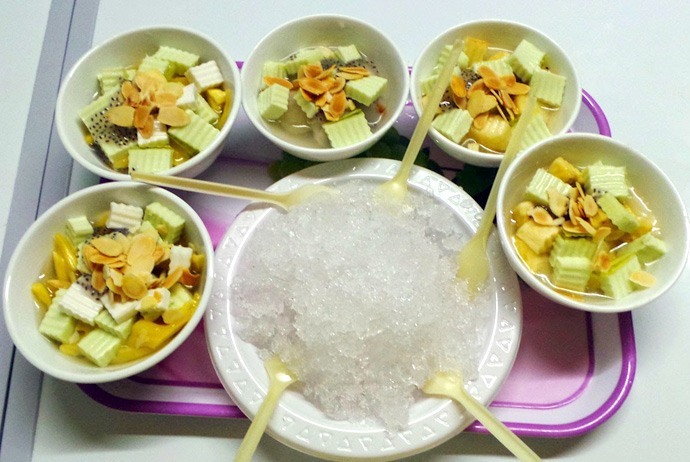 The next section will show some of the most common and enjoyable Vietnamese desserts, giving people a lot of quick and easy dessert ideas. Vietnamese Salted Fish Fried Rice – Where To Try Com Chien Ca Man In Hanoi? Vietnamese Banana Flower Salad – Why Goi Nom Hoa Chuoi Is Favorited In Hanoi? The first one on the list of easy cooking desserts in Vietnam I would like to introduce is a simple yet very tasty and enjoyable dish – Chinese stuffed sticky rice balls (or “banh troi tau” in Vietnamese). 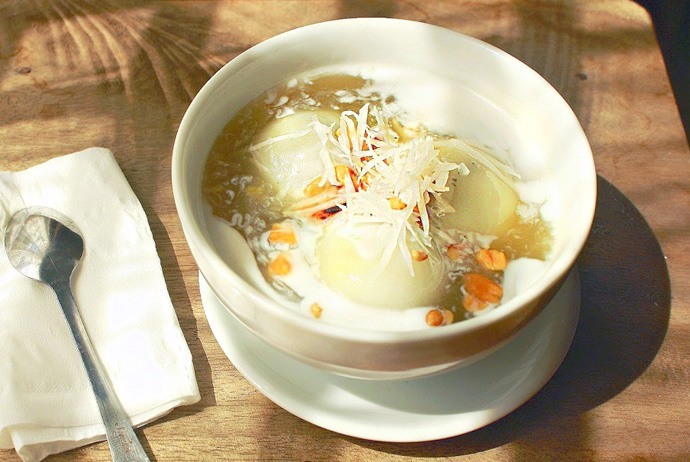 On the cold winter days, eating a bowl of hot Chinese stuffed sticky rice balls and enjoying its sweetness and fragrance, people will be able to blow the coldness of the winter away. Vietnamese fried cake is a little bit similar to “donut” in Western countries. However, this Vietnamese dish – one of the most common easy cooking desserts – is processed much more simply. Vietnamese fried cake is the glutinous rice balls which are deep-fried, popular in the Southern Vietnamese cuisine. 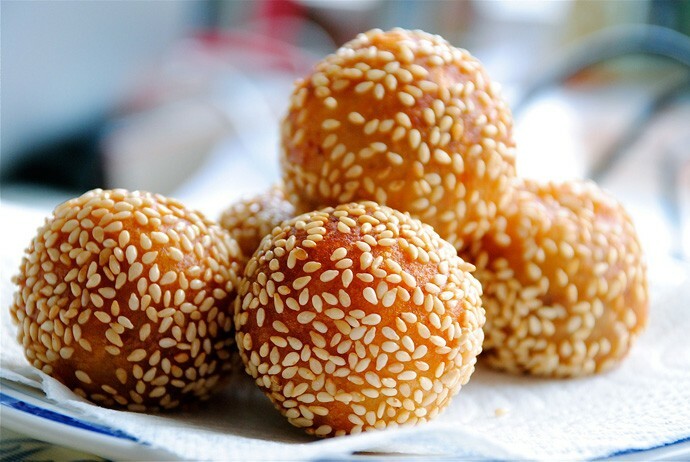 Its outer shell is made from glutinous rice flour, and covered with roasted white sesame seeds. The stuffing of this Vietnamese dessert is made from sweetened milled green bean, and scented with jasmine flower essential oil. Traditionally, the stuffing of this cake should be separated from the shell so that it is also called “banh ran luc lac” in Vietnamese. Vietnamese Green Mango Salad – Nom Xoai – Let’s Check It Out In Hanoi! 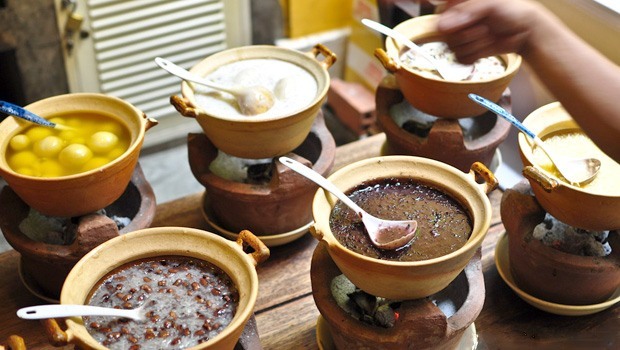 Vietnamese Oyster Porridge – Why It Is An Attraction In Hanoi & Vietnam Cuisine? Vietnamese Clam Worm Pie – Cha Ruoi – Where To Eat In Hanoi? Bai Sao Beach – Is It Really The Best Beach On Phu Quoc Island, Vietnam?